Last weekend was meant to be unremarkable enough. One last trip to the bush for the boys from the house to mark the departure of our dear friend Janno back to Europe. By the end of the weekend we had bonded like never before, but in circumstances we would never have wished for. We had somewhat randomly settled upon a safari camp on the edge of Kafue National Park (an expanse of preserved wilderness larger than Belgium). If the camp’s website had acknowledged that they lay more than 100km from the road on some very demanding and technical dirt tracks, I might have thought again but in a state of blissful ignorance off we went carving our way through soft sand and hard turns, fighting off repeated tsetse fly infestations in the blistering heat before making camp on Saturday morning. A rather pleasant (if disappointingly animal free) weekend quickly passed and by midday Sunday it was time to hit the trail back home. Feeling more confident about the road ahead, I navigated the first 70km of dirt track with ease and we were quietly cruising through yet one more massive set of ruts and divot’s when our whole world turned upside down … literally. It is still hard for me to piece together exactly what happened next – only vivid fragments of time remain. In the first we are skidding badly and heading towards a large ditch beyond the road. In the second the vehicle is on it’s roof, all four of us suspended like bats by our seatbelts. In the third a surreal stillness as we calmly ask each other if we were all ok – by God’s grace we are. The fourth is the stuff of a bad adventure movie – releasing belts, falling to the ceiling, the vague fear of fire whilst trying to decide which window presents enough space to crawl out from underneath. The final is a moment without panic or drama as we dust ourselves down and survey the upturned wreck of beautiful Nina – my pride and joy. Before we go further I should probably take a moment to introduce Nina to you all. 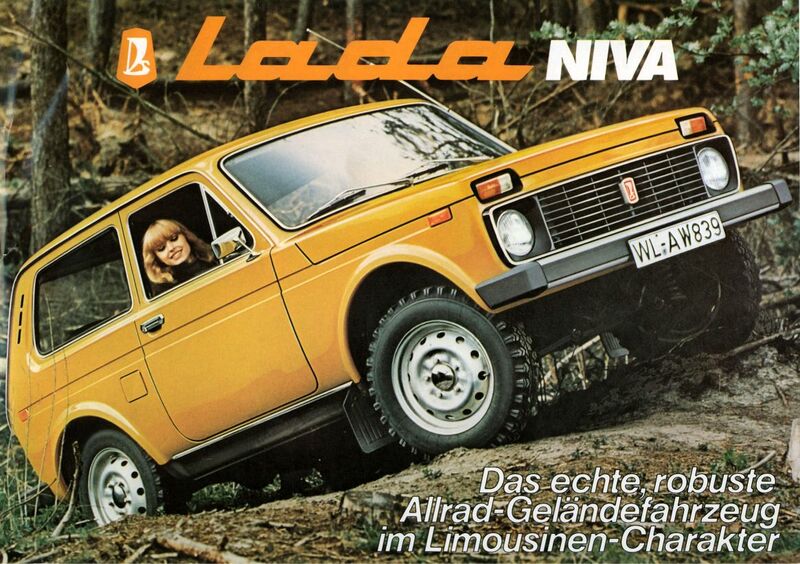 One of the greatest loves of my Zambian life, she is a five year old Lada Niva 4×4 – the only Russian Range Rover to be found on the highways of Zambia. Built as tough as the iron curtain she grew up behind with a stark Stalinist beauty, she has already taken me to far corners of the country with plans for many more trips to come. Now she lay prone, 4 wheels to sky, with a disturbing curl of white smoke emanating from her drive shaft. An advantage of travelling as 4 men is that upturned cars can be quickly righted and with a little more brute force pushed back on the road. All far deeper in shock than we appreciated, we determined that our back drive needed oil if the wheels were to turn again and decided to put Janno and Dominic on the first truck that passed (a tanker distributing home brew) to travel the 50km to the nearest township in search of oil and more importantly a mobile phone signal. Such was our collective daze that Janno left for the fuel station wearing only a very snug pair of swim trunks and thus had an inadvertently interesting afternoon as a tall Dutch man hanging round dusty Zambian truck stops in what can only be described as hot pants. Angelo and I settled in for the long wait for another vehicle to pass. I chose to keep my mind busy by endlessly trying to calculate whether abandoning the vehicle entirely was the most sensible option. Meanwhile Angelo, always a fastidiously tidy individual, found mental peace in neatly folding and arranging the crash debris of what had been the contents of the car. Both of us finding ways to avoid contemplating what could so easily have been if any one of us had been hurt – deep in the bush with no phone signal, no emergency services even if we could phone them, no passing vehicles and most importantly no hospital for over 150km. After five hours of waiting we had only been passed by two vehicles, one group who took a far greater interest in our belongings than our well-being and the other group reluctant to get out of the car for fear of roaming lions. At first we thought they were joking but we later discovered that indeed we had chosen a notorious spot for the creatures as they headed for the game park. As darkness began to fall, Angelo and began seriously considering the possibility of abandoning the car (for sure nothing would be left of it were we leave) and taking our chances with the lions on our way to the road. Our rescue, transport and lodging! So it was in keeping with this somewhat Biblical script, that into our modern day Lion’s Den should arrive a young gentleman named Daniel. A vision of Zambian friendship and enthusiasm who had chartered a truck to purchase maize from local farmers and was now winding his way back to Lusaka. After rapidly assessing our situation he instructed his driver and truck boys to man-handle Nina into position, jack the rear high in the air and strap her to the back of his truck. There were no spare ropes to be found so in a fit of African ingenuity replacements were quickly identified and released from their binds. In the space of 6 hours our seat belts had saved our lives twice! Over the next 20 hours we slowly made our way back towards the capital lying on top of 35 tonnes of maize. At first gazing into a galaxy of stars and trying desperately hard not to fall asleep for fear of rolling off the sacks onto the road. By 2am we were stopped by a (drunken) police patrol looking to penalise us for not properly reporting the accident and finding an approved towing facility (chance would have been a fine thing!!) By 3am the truck had run out of diesel and so there we lay sleeping by the side of the road until more fuel could be ferried out from Lusaka. As we sat waiting we learned about the many, many hours that these men spend waiting for parts to be fixed, fuel to arrive and police check points to be negotiated. We also learned about the challenges Daniel faced getting his maize from the countryside to the city and the difficulties of securing a profit when he got there. We were reminded how lucky we were that the first people on the scene had been interested in helping us rather than helping themselves to our valuables. About 24 hours into our journey, we reached the outskirts of the capital city and the truck crew felt able to cut us loose – not asking for a single kwacha in payment for all the trouble they had gone to get us that far. This being Zambia not everything was plain sailing and even sitting just outside Lusaka it was two hours before another mechanic could be found and another 4 hours before he decided that Nina’s Russian engineering were beyond his technical knowledge and he couldn’t help us after all. Finally in a fit of desperation a call was placed to my regular mechanic who knew a man who knew a man with a pick up truck. And so it was that 30 hours our initial flip that we made it back home, safe and well – if a little more tired and dirtier than I have been in a long time. I have many conflicting emotions regarding the whole episode. Dread of what could have been, relief at what was, concern at what would have happened if a less charitable bunch of travellers had come across us or even if we had decided to hike our way through lion country. Mostly however I am grateful for the whole affair. Grateful first and foremost that everyone walked away totally unscathed (Nina may need a bit of work). Grateful too for the Zambians I got to meet and interact with along the way. Grateful to Daniel for his immediate willingness to play the role of the Good Samaritan. Grateful to his driver and truck boy (the mighty Kanono) who made light work of heavy vehicles and for their ingenuity with seat belt strappings. Grateful too to have had a chance to share with them for a short time the hardships they endure travelling as they do for weeks at a time. Grateful to all the little kids who helped us while away many many hours playing and asking questions and never once taking advantage of our plight, grateful to their mothers who despite an evident lack of food came out to offer us some of what little they had. On any other day I would have sped past all these lives but on this one got to share a little bit of it with them all. For many reasons, life in Africa makes you feel closer to God. The issues of life and death seem so much closer at hand and suffering so clearer to see as to make the abstract concepts of faith somehow much more concrete. The events of this weekend certainly leave me with many things to be thankful to Him for. For anyone who wants to see the full set of photo’s click here. Good luck with the rehabilitation of Nina! OMG!!!! What an amazing story Berkeley, sounds scary as hell, but what an experience. Delighted to hear you are all good. You were wondering if life in Zambia was going to change your perspective on things -has this experience? How you doing? Awesome adventure, and brilliant writing! Glad to hear you guys made it back safe and sound. Would love to go on a trip like that, although minus the overturned car, and getting stranded in the middle of nowhere, which doesn’t leave much else! Isn’t there talk of a trip to Namibia with you around Christmas time??? I’m doing the driving! Great blog and thankfully a happy ending. There is no meaning in going to Zambia to do roller coaster… Good memories for your grand children. Janno arrived yesterday safely, Praise be to Him. He pointed to your very intresting weblog, what a joy to read it in such fine English.Janno is already off to Amsterdam to his sister where he might find a place to live the coming time. If you ever come to Holland Berkeley we would love to meet you and welcome you to stay at our house.